Have you been enjoying our blog these last few months? (We sure have enjoyed writing it!) If you have, feel free to nominate your girls for the 4th Annual Black Weblog Awards. Should the spirit move you, you only have to stop by BlackWeblogAwards.com/ and nominate your favorite blogs. You don't have to nominate a blog for every category if you don't want to- just for the categories you care about. 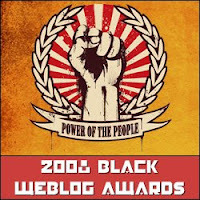 The Black Weblog Awards were created to recognize the best and brightest in the African-American blogosphere. Once the nominations are in, finalist voting will take place between August 17th and August 31st. Winners will be announced September 4th.